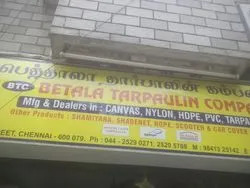 Established in the year 1988, at Chennai, Tamil Nadu, India, we, “Betala Tarpaulin Company”, are engaged in manufacturing and supplying superior quality Vehicle Cover, Tarfelt, Raincoat, Shed Net, Shamiyana Tent, Camping Tents, H.D.P.E Sheets and Tarpaulin. Apart from these, we are also trading and supplying optimum quality Nylon Ropes. These are widely demanded and acknowledged amidst our valued customers because of their features like flawless finish, high wear & tear resistant and resistance to temperature & chemicals. All our products are manufactured under the close supervision of our experienced professionals in an eco-friendly manner. Our diligent and qualified team of experienced professionals hold immense expertise and vast knowledge of their respective domains. These professionals use superior quality materials and sophisticated technology for manufacturing the defect free range. The quality analysts make sure that the materials used in the manufacturing process are procured from the reliable and trusted vendors of the industry. They also check the finished products on defined parameters, to ensure these are designed as per the defined quality standards. We have also developed a well maintained warehousing unit that helps in storing our manufactured and procured products in an organized and systematic manner. Our packaging professionals make sure that the products are packed in superior quality packaging material, to ensure their safe transit in different parts of the country. We are reckoned as one of the trusted firms, engaged in manufacturing and supplying of a superior quality Vehicle Cover, Tarfelt, Raincoat, Shed Net, Shamiyana Tent, Camping Tents and Tarpaulin. These are designed and developed by our experienced professionals, who are aware of the latest technological advancements and ever changing demands of the industry. To meet the specific requirements of our valued customers, we are offering these in standardized and customized specifications. We have a team of qualified & skilled professionals, which possesses wide industry experience and vast knowledge in their respective areas. These professionals work with utter determination, to meet the organizational goals within the set time frame. Our team of quality analysts check the manufactured and procured products on defined parameters, to ensure these are in compliance with the defined quality standards. 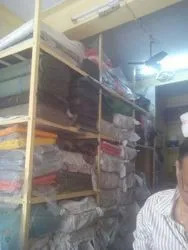 To meet the varied requirements of the customers, they ate also able to design the Vehicle Cover, Tarfelt, Raincoat, Shed Net, Shamiyana Tent, Camping Tents and Tarpaulin as per their specifications. We have associated ourselves with one of the trusted and reliable vendors of the industry. These vendors are selected by our procuring agents after doing extensive market research. They make sure that our vendors use superior quality nylon and sophisticated technology for manufacturing the Nylon Ropes. Our vendors also check these ropes on well defined parameters, to ensure their compliance with the defined quality standards. With the help of the vendors, we are able to meet the bulk requirements of our valued customers within the pre-defined time.